Let's Get Crafting is the UK's only knitting and crochet bumper magazine, arriving every month complete with needles, yarn and patterns to get you started right away. It doesn't matter whether you’ve been knitting for years or are just eager to learn, as there are projects to suit beginners as well as advanced knitters. Projects range from practical to whimsical, so whether it's a baby's jumper, stripy scarf or knitted cupcake you're after, you're sure to find the right pattern. A generous selection of free gifts accompanies every issue, providing all of the basic equipment you need. Add that to the magazine's monthly giveaways and this is a great value companion for any crafting enthusiast. Let's Get Crafting magazine is perfect for anyone who loves to knit and crochet. Each issue of your subscription includes a completely exclusive knitting and crochet kit to get you started on the stunning projects inside. Whether an expert or novice, Let's Get Crafting project ideas, top designer tips and latest news will give you the inspiration to create beautiful clothing, accessories and gifts from scratch. 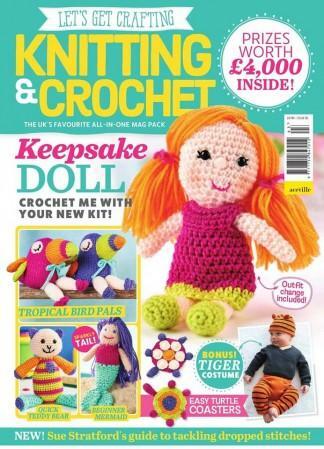 A subscription to Let’s Get Crafting magazine is a must-have for knitters of all skill levels. A really interesting informative magazine.New designers are often featured along with the latest products. The use of colour is inspiring. The clincher is the enclosed yarn, needles and crotceenabling an immediate start on an enclosed project. I recently came across your magazine as a friend of mine buys it. I eagerly looked at your site as I only wish to purchase 1 back issue but I cant see how you order just the 1? any ideas please?? The best ever crafting kit!